L.A.: Jennifer Dalton, On a Scale From Not Really Ok to Really Not Ok, at Charlie James Gallery. Opens Saturday at 7pm. L.A.: Steve Roden, Rag-Picker, and Dave McKenzie, Where the Good Lord Split You, at Susanne Vielmetter. Opens Saturday, in Culver City. L.A.: Mark Dean Veca: 20 Years — Work From the New Monograph, at Western Project. Through October 26, in Culver City. There will be a book signing and release this Saturday, September 14, at 6pm. S.F. : Structurally Sound: New Works by Augustine Kofie, at White Walls. Opens Saturday. Miami: LAndscape, a group show, at Fredric Snitzer. Opens today at 7pm, in the Arts District. Savannah, Ga.: Ellen Gallagher, Ice or Salt, at the SCAD Museum of Art. Through January 19, at the Savannah College of Art and Design. NYC: this is our house/this our roles/and we can’t stop, at Microscope Gallery. Opens Saturday at 6pm, in Bushwick. NYC: New Photography 2013, at the Museum of Modern Art. Opens Saturday. NYC: Interwoven Globe: The Worldwide Textile Trade, 1500-1800, at the Metropolitan Museum of Art. Opens Friday. NYC: Lose Not Heart: J.D. Salinger’s Letters to An Aspiring Writer, at the Morgan Library and Museum. Through January 12, in Midtown. NYC: Raymond Pettibon, To Wit, at David Zwirner Gallery. Opens Thursday, in Chelsea. NYC: John McCracken, Works from 1963-2011, at David Zwirner Gallery. Through October 19, in Chelsea. NYC: Totem, at Asya Geisberg Gallery. Opens Thursday at 6pm, in Chelsea. NYC: Brian Adam Douglas, How to Disappear Completely, at Andrew Edlin Gallery. Opens Thursday, in Chelsea. NYC: David Ellis, Hudson River Alley, at Joshua Liner Gallery. Opens Thursday at 6pm, in Chelsea. NYC: Hisachika Takahashi: Draw a Map of the United States, From Memory, and Pataphysics: A Theoretical Exhibition, at Sean Kelly. Opens Friday, in Chelsea. 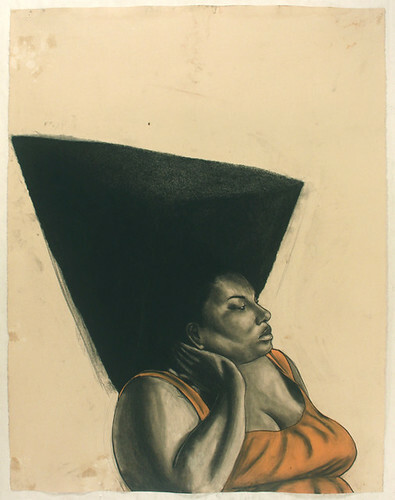 NYC: Radical Presence: Black Performance in Contemporary Art, at the Grey Art Gallery at NYU. Through December 7, on Washington Square Park. NYC: Radio Waves: New York ‘Nouveau Realisme’ and Rauschenberg, at Sperone Westwater. Opens next Tuesday, on the Lower East Side. NYC: Rachel Beach, Long Standing, at Blackston Gallery. Through October 27, on the Lower East Side. NYC: Matisse: The Essence of Line, Selected Prints: 1900-1950, at the Marlborough Gallery. Opens today, in Midtown. NYC: Janet Cardiff: The Forty Part Motet, at the Cloisters. Through December 8, in Inwood.